One of the most interesting aspects of Martian geology that I have been involved with recently is the analysis of a meteorite crater on Mars called "Tooting". Tooting is the name of my home town in South London, England, and so I was delighted when I was able to propose the name to the International Astronomical Union (IAU) and have the name approved. (Note that there is quite an elaborate process that the IAU follows, so that you just can't randomly propose any name and get it approved!). You can see some of the general characterisitics of Tooting Crater in the image below. Mars has some very unusual impact craters compared to examples on the Moon or Mercury because many Martian craters have a distal ridge (or "rampart") around the perimeter of the ejecta blanket. This is believed to have formed from a ground-hugging flow created as the impact took place in a volatile-rich target. Tooting Crater is a very fresh example of a rampart crater, because it shows minimal signs of erosions and there are almost no small impact craters on the ejecta blanket. 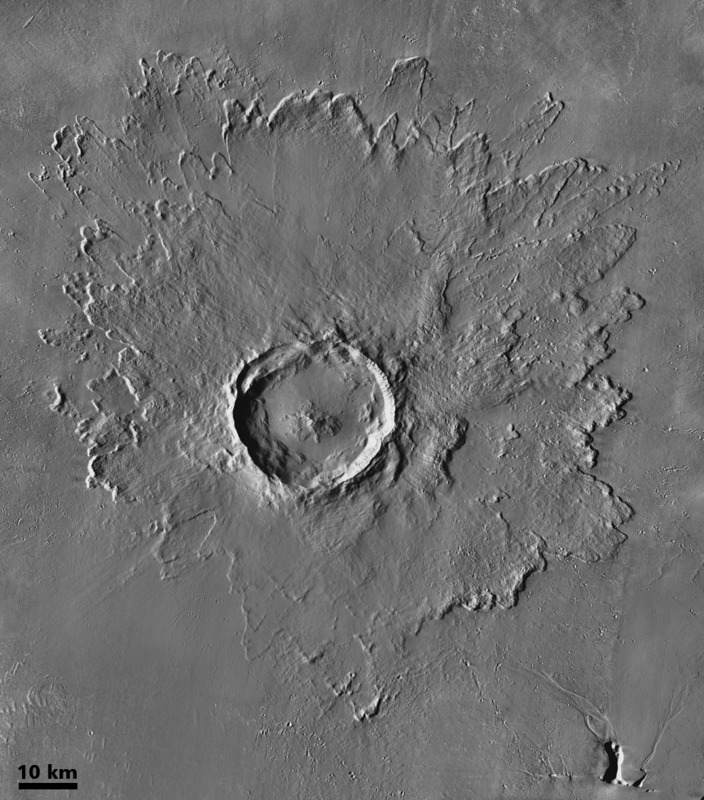 Tooting Crater is about 27 km in diameter, and is located at 23.4N, 207.5E, just to the west of Olympus Mons volcano (which is often cited as the largest volcano on Mars). 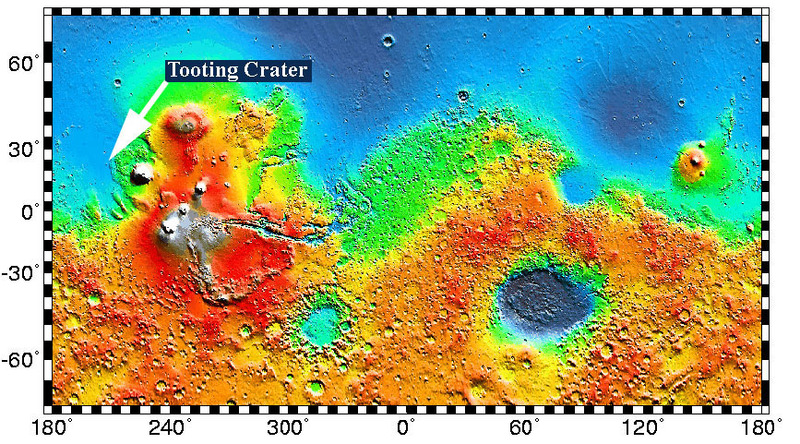 You can see the location of Tooting in the map below, which is a MOLA elevation map of Mars. Because it is a very young crater that formed on young lava flows, Tooting may represent a potential source for some of the Martian meteorites (which also have a young age and are volcanic rocks). Mouginis-Mark, P.J. and H. Garbeil. Crater geometry and ejecta thickness of the Martian impact crater Tooting. Meteoritics and Planetary Science, 42, 1615 - 1626, 2007. Morris, A. R., P. Mouginis-Mark and H. Garbeil. Possible impact melt and debris flows at Tooting Crater, Mars. Icarus, 209, 369 - 389, 2010. Mouginis-Mark, P. J. and J. M. Boyce. Tooting crater: Geology and geomorphology of the archetype large, fresh, impact crater on Mars. Chemie der Erde Geochemistry, 72, p. 1 - 23, 2012. 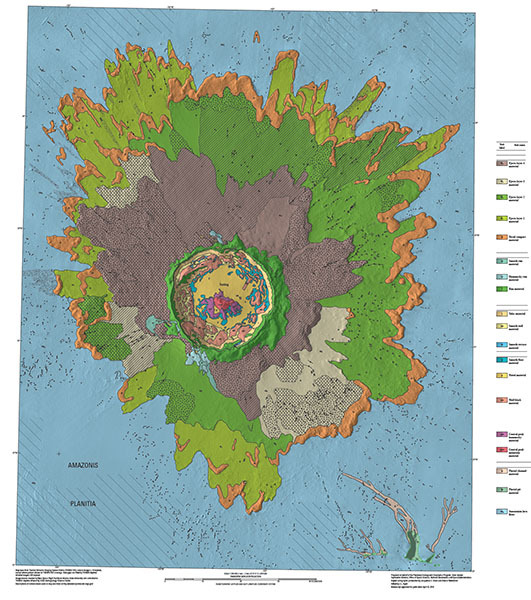 I have also created a 1:200,000 scale geologic map of the crater, and this map will be published in mid-2015 by the U.S. Geological Survey as Scientific Investigations Map 3297. A small version of this map is shown below. 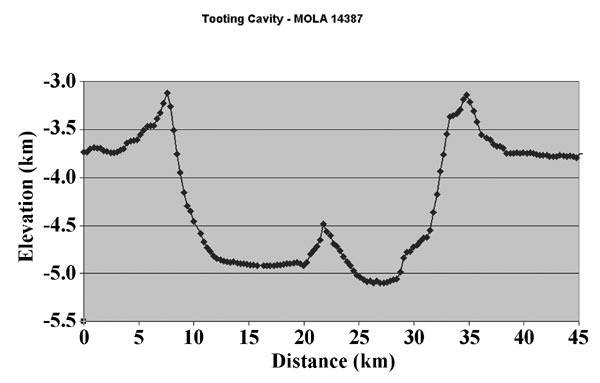 Topographic data from the MOLA instrument allows a profile across the crater to be derived. You can see that the crater has a rim that is about 700 meters high, and that the floor of the crater is about 1,200 meters below the level of the pre-existing terrain. There is also a prominent central peak in the interior of the crater that rises about 500 meters above the level of the crater floor. Tooting Crater is also unusual as Martian meteorite craters go because there is a large number of smaller craters (called "secondary craters") around the perimeter of the ejecta blanket. 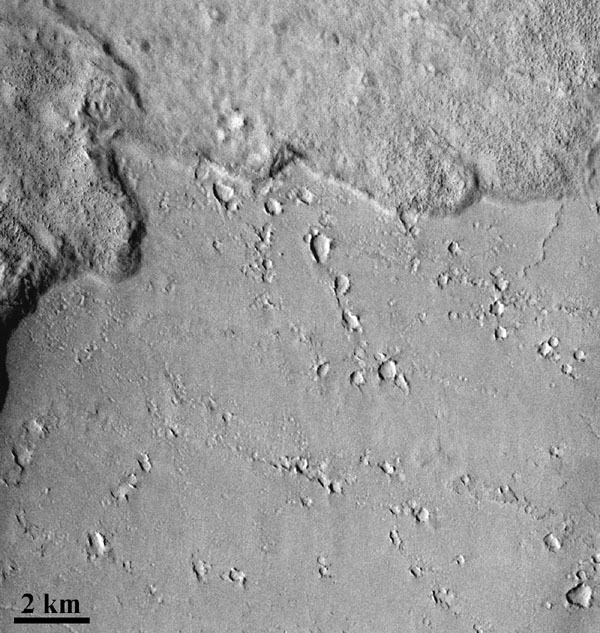 The image below shows some of these secondary craters, which are believed to have formed when blocks of material thrown out of the crater cavity during the impact event re-impacted the surface. There is just a chance that one such block, instead of landing back on Mars, escaped the gravity of Mars and travelled to earth, to be found here as one of the Martian meteorites. If this is the case, then the age of the meteorite (~1.3 billion years old) is also the age of the lava flows within which Tooting Crater formed. My old home town isn't quite as scenic as eastern Amazonis Planitia on Mars, but it still has a lot going for it. One thing is its long history! 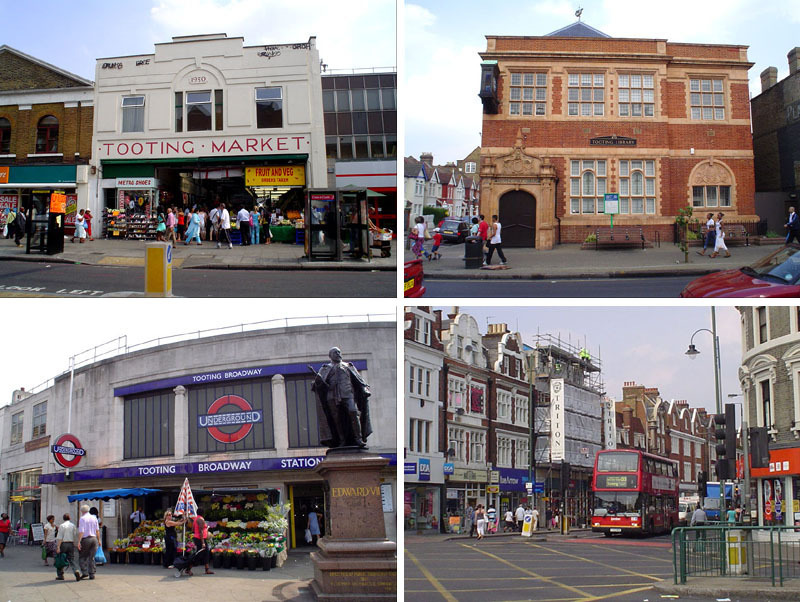 Tooting was first described back in the year 675 A.D., when it was called "Totinge". It was also mentioned in the Domesday Book in 1086. At that time, it comprised two manors - namely Upper Tooting and Tooting Bec. It was owned by the Abbey of St. Mary of Bec in Normandy, France, which is where the name "Tooting Bec" comes from. "Tooting" comes from the name of the Saxon Tota and follows the old English custom of adding "ing" (which means "the people who lived at") to the person's name. Thus "Tooting" literally means "The home of Tota's people".